Immunofluorescent analysis of Phospho-Histone H3 pSer10 (green) in HeLa cells. 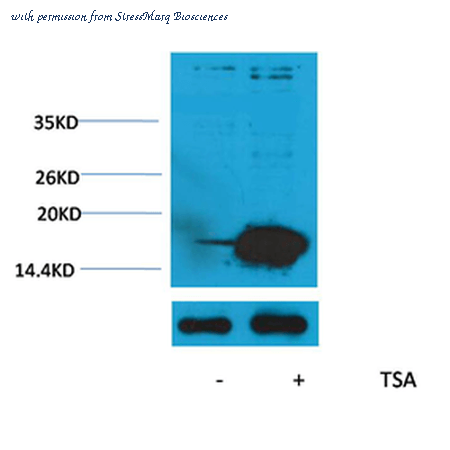 Formalin fixed cells were permeabilized with 0.1% Triton X-100 in TBS for 10 minutes at room temperature and blocked with 1% Blocker BSA (Product # 37525) for 15 minutes at room temperature. 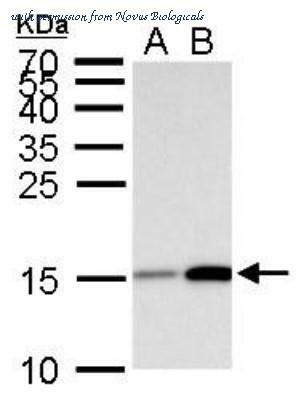 Cells were probed without (left panel) or with (right panel) a Phospho-Histone H3 polyclonal antibody (Product # PA5-17869) at a dilution of 1:100 for at least 1 hour at room temperature, washed with PBS, and incubated with DyLight 488 goat anti-rabbit IgG secondary antibody (Product # 35552) at a dilution of 1:400 for 30 minutes at room temperature. F-Actin (red) was stained with DyLight 554 Phalloidin (Product # 21834) and nuclei (blue) were stained with Hoechst 33342 dye (Product # 62249). Images were taken on a Thermo Scientific ArrayScan or a ToxInsight Instrument at 20X magnification. 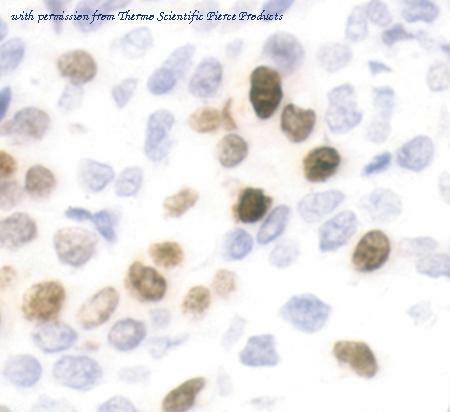 Immunohistochemistry was performed on paraffin-embedded human breast carcinoma. To expose target proteins, heat induced antigen retrieval was performed using 10mM sodium citrate (pH 6.0) buffer for 10 minutes at 95C. Following antigen-retrieval, tissues were incubated in 3% hydrogen peroxide for 10 minutes, washed, and then blocked in 5% normal goat serum in TBST for 1 hour at room temperature. Tissues were stained with a Phospho-Histone H3 polyclonal antibody (Product # PA5-17869) at a dilution of 1:200 overnight at 4C. 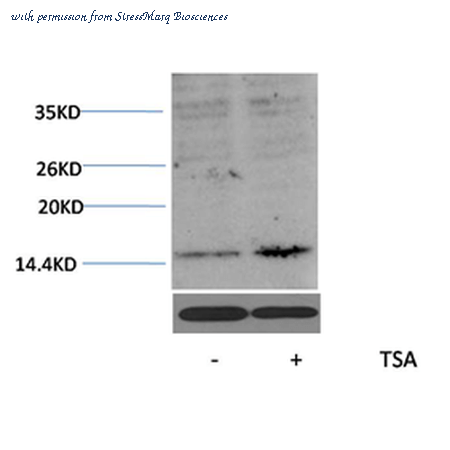 Tissues were washed extensively with TBS + 0.1% Tween-20 and detection was performed using a HRP-conjugated secondary reagent followed by DAB substrate. 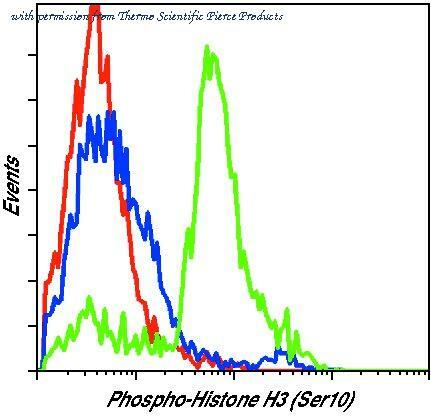 Flow cytometric analysis of Phospho-Histone H3 pSer10 on Ramos cells left untreated (blue histogram) or treated with serum/calyculin (green histogram). 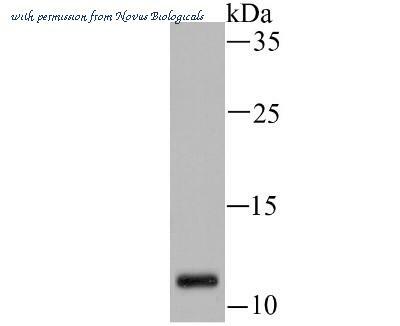 Cells were harvested, fixed with formaldehyde, permeabilized with methanol, and incubated with a Phospho-Histone H3 pSer10 polyclonal antibody (Product # PA5-17869) at a dilution of 1:50 for 1 hour at room temperature. As a negative control, serum/calyculin-treated cells were stained with an isotype control (red histogram). 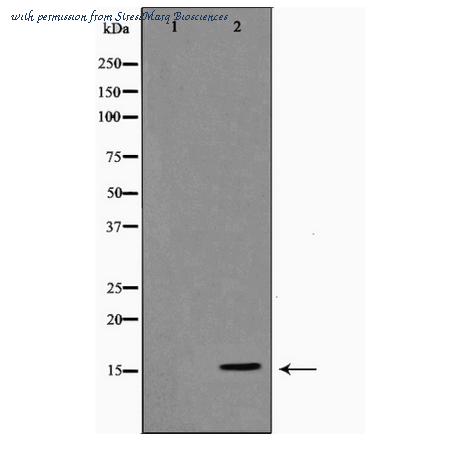 Following staining with either PA5-17869 or isotype control, cells were stained with a fluorescently-conjugated anti-rabbit IgG secondary antibody and analyzed on a flow cytometer. 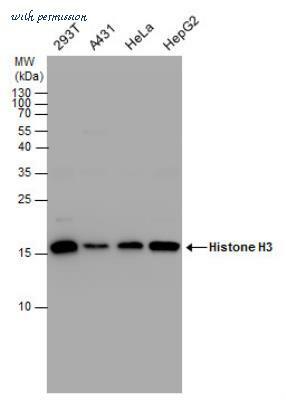 Western Blot: HIST1H3A Antibody (JU43-26) [NBP2-75522] - Analysis of Histone H3 (acetyl K14) on Jurkat cell lysate using anti-Histone H3 (acetyl K14) antibody at 1/500 dilution.